International Business 8 Edition &>For International Business Courses. Successfully prepare students for the international marketplace. International Business illustrates how successful managers must function in a competitive world. 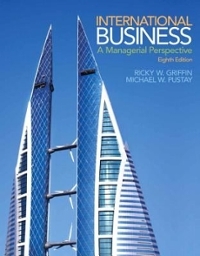 Packed with current examples that reflect the vibrancy of the international business field, this student-friendly text offers a managerial approach that keeps an emphasis on skills development, emerging markets and geographical literacy. MyManagementLab for International Business is a total learning package. MyManagementLab is an online homework, tutorial, and assessment program that truly engages students in learning. It helps students better prepare for class, quizzes, and exams–resulting in better performance in the course–and provides educators a dynamic set of tools for gauging individual and class progress. Teaching and Learning Experience This program will provide a better teaching and learning experience–for you and your students. Here’s how: Improve Results with MyManagementLab: MyManagementLab delivers proven results in helping students succeed and provides engaging experiences that personalize learning. Provide a Thorough Understanding of Emerging Markets: Reinforce topics through numerous cases, inserts, and end-of-chapter questions and exercises. Keep your Course Current and Relevant: New examples, exercises, and statistics appear throughout the text. Note: You are purchasing a standalone product; MyManagementLab does not come packaged with this content. If you would like to purchase both the physical text and MyManagementLab search for ISBN-10: 0133768759/ISBN-13: 9780133768756. That package includes ISBN-10: 0133506290/ISBN-13: 9780133506297 and ISBN-10: 0133543978/ISBN-13: 9780133543971. MyManagementLab is not a self-paced technology and should only be purchased when required by an instructor.